Yesterday was dark and dingy all the live long day. I went to the market like a good girl, but I found myself feeling heavy and tired the whole day--I usually do on days like that, unless it's one of those rainy summer or spring days which although grey, somehow seem kind of wonderful... I love those kinds of rainy days! I awoke this morning to the sound of birds chirping, and opened my drapes to greet a beautiful sunny day! It's a lot cooler now than it had been for the previous two weeks, unfortunately, but that's OK. The early crocuses are up, the trees are budding, and spring weather is thankfully just around the corner. 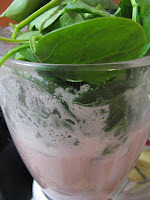 I also awoke this morning with a need for a creamy smoothie! I'd made oatmeal (the real kind of course) thinking I might feel the need for some healthy grains, but nope! My body wanted a smoothie. Well OK then...smoothie it is! I had soaked almonds ready to make almond milk in the fridge. I discovered a couple of weeks ago that you can keep soaked almonds in the fridge for a few days, if you drain them and rinse them after soaking overnight. What an amazingly helpful tidbit! What it means, is that I can soak a couple of days worth of almonds for almond milk (aka about 2 cups), and keep them in the fridge to use if I don't need almond milk right away. Isn't it amazing how such simple things can make our lives so much easier?! Anyway, after I made the almond milk, I threw in about 10 strawberries (I found organic ones at the market, which is amazing. They're obviously not local, but since just about nothing is local this time of year, what can you do? ), a tiny bit of raw honey because the strawberries are of course a bit tangy, some maca powder, a banana, and about 2 tbsp chia seeds. I added the chia seeds because I know that my body likes a bit of protein with each meal, and the almond milk has hardly any. The chia seeds will also help to keep me full! 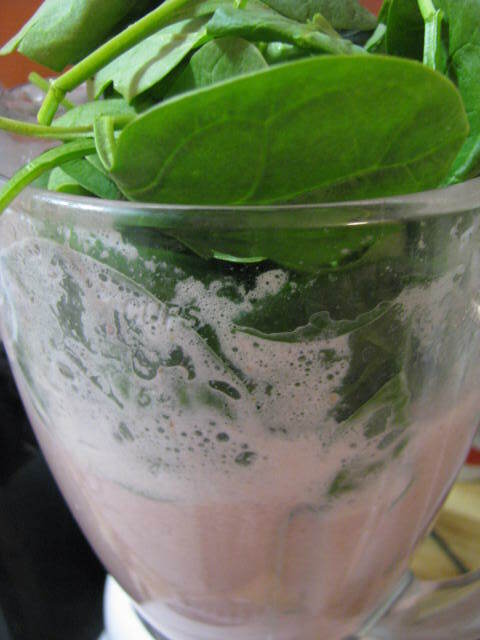 Of course, then I had to change it, by adding 2 big handfuls of spinach. 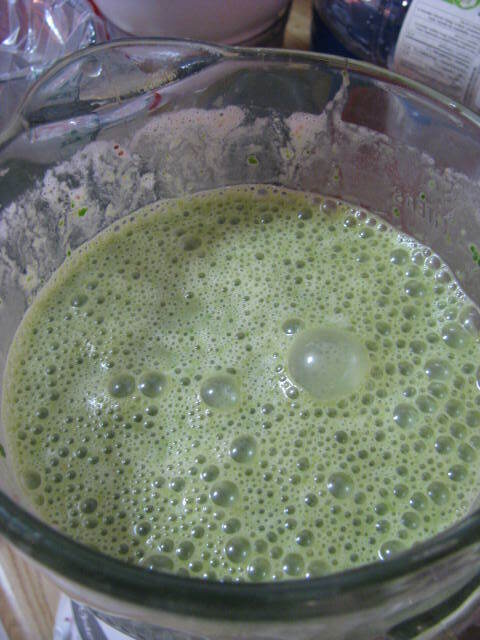 Gotta make it as nutritious as is reasonable, and since spinach has no taste in smoothies, why not right? So bye-bye bubblegum, hello green goddess goodness!! I made an entire blender full, a good 6 cups, so I poured 2/3 of it into the biggest glass I could find for my breakfast, and the rest, about 14 oz worth, is in the fridge for later. 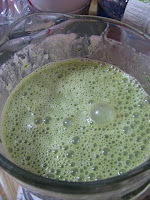 Oh by the way--I'm almost finished the smoothie, and it's delish! !